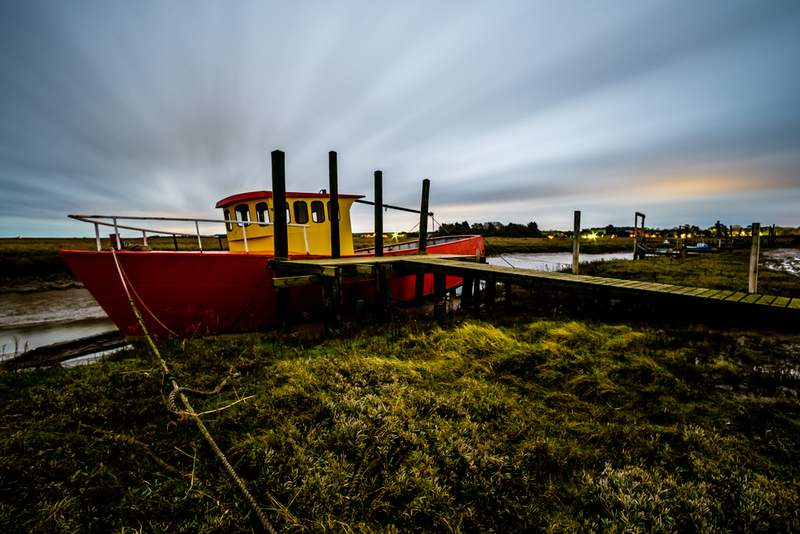 With the recent photographic talk presented by Tony Worobiec on taking night time landscapes, I have been visiting the Norfolk Broads and the North Norfolk Coast to try this out for myself. Taking images of the night sky is very different to taking nighttime landscapes. When taking images of the night sky, typically cameras are pushed to the limits of high ISO and with the lowest aperture possible to gather as much light before the stars start to blur due to the rotation of the planet. Also added to the fact that a clear sky is desired with no moon which limits the opportunities further. With taking landscape images at night, long exposures of at least 2-3 minutes and longer are required to gather enough light to create a properly exposed image to look as if the image was taken during the daytime. This type of photography is much easier to capture as I was mostly using an ISO between 200-400 with an aperture of around F/8. I can see all modern cameras made within the last 5 years would be capable of these settings and produce acceptable results. As a clear sky is not required, having clouds would be beneficial as moving clouds are very effective with long exposures, the only time when not taking nighttime landscapes could be a challenge would be during rain. Even then that could be possible and interesting if the camera was inside pointing out of a window. All that is required is an intervalometer that can be purchased from eBay around £15 and a good sturdy tripod. Taking pictures at night can be tricky in terms of setting the focus point, on a manual focus lens such as the stunning Samyang 12mm F/2 (est £140 I spent) where the focus markings are clear and easy to read is fairly straight forward. On auto focus lenses I find a distant light for the lens to lock onto and then turn off the autofocus, if there is no distant light is around then I shine my torch onto something to the desired distance for the camera to set the focus. Finding the desired composition can be difficult in the dark even for a mirrorless camera as it was literally "a shot in the dark". The best way I found was to take a quicker snapshot by bumping up the ISO and lowering the aperture and capturing a minutes exposure. Once I found a good composition I the went back to an ISO of around 400 and aperture of F/8 to get a more cleaner image and more movement in the clouds. These setting I used were from trial and error, I set an initial exposure with a low ISO and mid Aperture and guessed the shutter speed. To bight and I would need a shorter exposure, to dark and a longer exposure would have been needed. If the shutter speed is taking too long then dont be afraid of increasing the ISO. Ending this post with a word of warning, I took some risky steps that I would not recommend anyone to take. At Burnham I was actually standing the the sea and my wellies only had a few centimetres clearance and the ground was mostly stones making it possible to support myself on the mud. A couple of years ago I visited Morston which is not too far from Burnham and it was in the daytime. I had the great idea of wanting to stand in the middle of the river as the tide was out to get a better angle of a small boats laying on the mud. Soon as I put one foot into the empty river (wearing wellies) it sank a good few inches and created suction. Not being able to initially move it out I started to panic, I eventually got out of that situation a bit more dirty than I wanted but made me appreciate the potential dangers when out and about. First attempt at night time landscapes just before dawn a week prior. Not a picture that I like. Only because someone else arrived and went into the very low river and started walk around I thought it was worth a try and I used the tripod to test the ground before advancing my next step. As I was in the water, the risk of dropping any equipment in the sea was a very real possibility and I needed to change the lens, increasing the risk further. Not recommended! Thornham just up the road was a very different environment and was like walking on ice with the wet mud, again walking with great care was essential.